We won’t single them out by name, but this picture takes home the “Most Heinous Interior of the Month” award. If you have children, your backseat might look something like this. Rick’s can clean out the backseat of you car, SUV, or Minivan and prevent any bacteria or mold from harming your precious cargo. You can bring your car to Rick’s for an interior only detail. Even if your car is worse than this picture, we don’t mind. 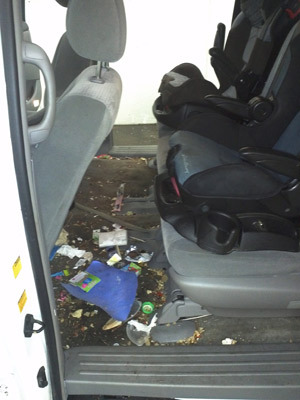 We will clean out your backseat cafeteria and leave your car looking like it did before you had children. We are still looking for a way to prevent them from throwing things on the ground, so check back for updates. This entry was posted in Maintenance Tips, News. Bookmark the permalink.